Kari's Law Goes into Effect Sept. 1: What you need to know. Senate Bill 788 (Kari’s Law) will become effective, September 1, 2016. For a multi-line telephone system that provides outbound dialing, Kari’s Law requires direct access to 9-1-1 service without the user having to first dial an initial number, digit, prefix or other access number or code before dialing 9-1-1. If needed, a business service user can obtain a one-year waiver (September 1 – August 31) of the law’s requirements upon the timely submission of an affidavit that (1) the business service user made a good faith attempt to reprogram or replace the telephone system; and (2) that reprogramming/replacing of a non-compliant telephone system would be unduly and unreasonably cost prohibitive. More information about how to comply with the law can be found HERE along with the electronic waiver application. See the FAQs or contact karislaw@texas911.org for additional information. A 2-year-old North Texas boy with a disease that makes walking a challenge has a free brand-new, custom-made walker thanks to the generosity of some Home Depot employees. Workers at the Home Depot in North Richland Hills are used to helping people pick out tools and supplies for their home projects. But in the case of 2-year-old Silus Johnson, three employees told the boy’s family they would take the project from there. Assistant Manager Matthew Spencer said he walked up to a customer to ask if he needed any help. He was talking to Silus’ grandfather who was working on building a special walker for his grandson. When Spencer learned that Silus had Norrie Disease, leaving him blind and with low muscle tone, the idea to help popped up. Since regular walkers were just too small for the 2-year-old, Spencer quickly brought in tool rental supervisor Eric Bindel. And the genius behind it was tool technician Chris Wright, who started with some 1-inch PVC and ran with it. After two days and working on his day off, Wright and other Home Depot dads, fueled by their overwhelming desire to help Silus, crafted his walker. “We need to recognize these gentlemen who put their heart and hard work into making this for my son. They don’t even know us,” said Silus’ mom, Jessica Johnson. “It was just really nice to know that I did this for this child, and he liked it a lot,” said Wright. And then came the moment when Silus got to take it for a spin. For Jessica Johnson, the challenges of a special needs child can sometimes be overwhelming until something like this happens. “I’ve prayed for them that God could bless their families because they’ve definitely blessed ours,” said Johnson. The walker has metal broom handle prices on all four corners that extend. So as Silus grows, the walker can grow with him. For more from Fox News Dallas, click here. Texas has a robust, diverse and thriving retail industry which employs over 1.9 million Texans. These independent proprietors, as well as large multi-national corporations, comprise the membership of the Texas Retailers Association. Throughout our 90 year history, department stores, specialty shops, drugstores, grocery stores, discount stores, hardware stores, jewelry shops and many other retailers doing business in Texas have all become members of the Texas Retailers Association. It all began in July of 1926, when more than one hundred Texas merchant’s met at the Gunter Hotel in San Antonio, Texas, and created the United Merchants of Texas. Years later, the group changed its name to the Texas Retail Dry Goods Association, and after several decades became the Council of Texas Retailers. In the late 1950’s the organization became the Texas Retail Federation and was based in Houston and in 1967, the Federation was relocated to Austin, and renamed the Texas Retailers Association with Michael R. “Mickey” Moore as Executive Director. In 1984, the Texas Food Marketing Association, which represented supermarkets, merged into TRA and the Texas Federation of Drug Stores (chain drug industry) and became members of TRA as well. After successfully leading Texas Retailers for 35 years, Mickey Moore retired in 2001. Save the Date! 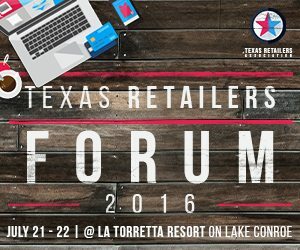 The second annual Texas Retailers Forum will be July 23-24, 2017 at Marriott Champions Circle in Fort Worth, Texas. This year we’re bringing back special workshops targeted to your industry including organized crime, small retailer focus groups and grocery specific sessions. The event will include our Awards Dinner and, new to this year, will be a closing party you won’t want to miss. Become a sponsor or reserve your exhibit table today (link to sponsor pricing). Below are some photos from 2016. The Texas Retailers Inaugural Forum brought together more than 150 retail industry leaders for two days of of targeted training workshops for small retail, large retail, grocery and industry suppliers. We provide sessions regarding organized crime, maximizing your online reputation and participants were made aware of upcoming legislation that could directly affect retailers. Our post event survey showed a 100% satisfaction rate, with 95% stating they’d be interested in coming back next year! Jay Bueche Texas Federation of Drug Stores Rep H.E.B. The Texas Retailers Association celebrated champions of the retail industry during their inaugural Forum’s awards ceremony at La Torretta Resort on Lake Conroe. The Forum brought together more than 150 retail industry leaders for education, networking and honoring award winners. Texas’ own Brookshire’s Grocery received the title of Large Retailer of the Year with Target and Walmart coming in as finalists. Brookshire’s Grocery has been actively involved at every level of supporting the state retail industry including promoting lobbying efforts both locally and nationally. TRA presented Walmart with the Education Champion award for their support of the Retailers. They have contributed to TRA’s efforts to provide retail management training to small business store owners. Finalists within this category that also promote industry education were Academy and Lewis Foodtown. Kroger was recognized as Grocer of the Year as an instrumental member of Texas Retailers Association. They are supportive of issues involving customers on the front end, especially the Supplemental Nutrition Assistance Program. HEB, Brookshire Brothers and Brookshire Grocery were finalists. The Forum also focused a session track on small but growing Texas retail businesses. Katy-based Amber’s Designs, run by Amber Gustafson, won Small Retailer of the Year. Amber’s Designs creates and sells fine jewelry. Aggieland Bookstore and BookPeople were also recognized for their achievements in the small retail sector. U.S. consumers are starting to shop for groceries more frequently online, and this option is even starting to replace in-store shopping for some, according to a new Harris Poll survey. 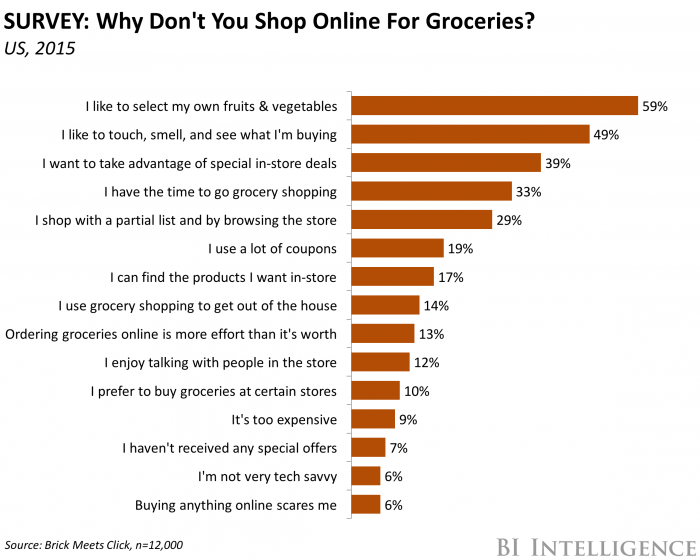 Overall, 31% of U.S. shoppers had bought groceries online “in the past six months.” The survey was conducted in late Jun 2016. Furthermore, 10% of those who bought groceries online said this habit had replaced some or all of their trips to traditional stores. This process is most common in urban areas, where 38% of shoppers buy online. This compares to 30% in suburban areas and 25% in rural areas. This likely reflects the availability of these online grocery services primarily in urban areas with dense populations and sophisticated navigation technologies. But as their popularity grows, these services should start to appear in suburban and rural areas. However, online merchants face a significant hurdle to mass adoption. Almost 60% of U.S. consumers who have never shopped for groceries online refuse to do so because they like to select their own fruits and vegetables in person, according to a Brick Meets Click report. Half of these people say they prefer to touch, smell, and see the produce before they buy it. But grocers can boost their online sales through omnichannel services that would help ease shoppers into the idea of buying online. Click and collect, for example, is growing among grocers because it lets shoppers order online and then inspect the items when they pick them up at the store. This bridges the gap between physical and digital shopping. The contents of this article were sourced from Business Insider, click here for the original article. That’s how Donna Garren, regulatory affairs and technical specialist with the American Frozen Food Institute, describes the challenge that food facilities are grappling with as they move toward the deadline for compliance with the Food and Drug Administration’s preventive controls rule for human food. Put preventive controls into place for dealing with those hazards. Facilities also have to verify and document that their preventive controls are working. Also, according to the rule, the plans must be re-analyzed at least once every three years. Compliance dates vary according to the size of the company. But for the largest ones, the deadline is Sept. 16. Small and mid-sized companies have until September 2017, and very small companies have until September 2018. There’s no waffling on this. The FDA clearly spells out when companies must come into compliance. The good news — at least in the case of the larger companies — is that many, if not most, of them have already been making changes and are therefore “definitely getting there,” Garren said. “The majority are in a good place,” she said, explaining that many of them already have food-safety standards in place, which include those of the Global Food Safety Initiative, as well as food safety requirements for the British, French, Italian and German markets. The FDA oversees dietary supplements, bottled water, food additives, infant formulas, pet foods, livestock feeds and most other human foods not under the jurisdiction of the USDA, which regulates meat, poultry, dairy, eggs and catfish. Foreign producers selling to U.S. buyers must also gain certification that they’re complying with the FDA’s preventive controls rule. “Companies are really committed to this,” Garren said, although she conceded that she’s sure there are some companies that need to know more about it to meet the compliance deadlines. She urges the small, medium-sized and very small companies to take advantage of the time they still have left. As for the very small companies, Garren said that county extension agents at land grant universities are going through training to help. “They can be a good resource,” she said, adding that they can help provide access to pilot plans geared to the needs of the very small companies. “It’s about adopting a culture of food safety to produce safe food,” said Garren. In explaining the need for the rule, FDA points to high-profile outbreaks of foodborne illnesses during the past decade. Statistics show that foodborne illnesses strike an estimated one in six Americans each year. According to the agency, about 128,000 people in the United States are hospitalized, and an estimated 3,000 die each year from foodborne illnesses. “Requiring preventive measures at facilities that produce human food is an important step in reducing foodborne illness for people,” FDA reports. In other words, this isn’t just about food manufacturing facilities; it’s about every point along the supply chain, from production plants to restaurant kitchens, preventing foodborne pathogens such as E. coli, Salmonella, Listeria, and Campylobacter from sickening and sometimes killing people. The FDA regulates about 80 percent of the U.S. food supply — approximately $602 billion in domestic food and $64 billion in imported food each year. The preventive controls rule will cover an estimated 97,600 domestic and 109,200 foreign facilities. According to FDA, in 2011, about 50 percent of the fresh fruit consumed in the U.S. was imported. Although some activities carried out on a farm may classify the farm as a facility, the rule doesn’t pertain to operations that meet the FDA’s definition of a farm. The Produce Rule, another part of the Food Safety Modernization Act, goes into effect in November 2017. It includes standards for growing, harvesting, packing and holding of produce for human consumption. For the most part, it covers produce that will be eaten raw. What if facilities miss the deadline? To begin with, although the compliance date for the larger facilities is set for Sept. 16, Gorny said that the FDA still needs to train inspectors, which he describes as “a heaping huge job.” He doesn’t think they’ll start doing inspections until some time in January. If a facility is not in compliance, the FDA can issue a warning letter of violations and list the changes that need to be made. Once the changes are made, the FDA will reinspect. The agency can ask the facility to recall a product, or products, voluntarily. The agency can mandate a recall. The agency can withdraw a facility’s registration. The agency can go to court and seek a permanent injunction. Bottomline, it’s all about preventing foodborne illnesses instead of reacting to them, as was the case before the Food Safety Modernization Act was signed into law. All facilities covered under the preventive controls rule must have a written food-safety plan, which includes an analysis of hazards and risk-based preventive controls. The first step is identifying where hazards pertaining to food safety exist in the facility. From there, controls to prevent the hazards must be put into place, including having an established recall procedure. The written plan must show how the preventive controls are monitored and managed to make sure they’re effective and to correct problems that may arise. Then there’s verification and validation. Simply put, validation means your preventive controls are working, and verification means that the controls are being implemented effectively. All of this requires documentation. There’s a lot of record keeping to be done. “You need to get your records in line and have them organized and ready for the FDA inspectors,” said Brackett. What about the human element? Some of the agency’s previously “non-binding” provisions, such as education and training, are now binding. For example, management must ensure that all employees who manufacture, process, pack or hold food are qualified to perform their assigned duties. That means, they must have the necessary education, training and/or experience. They must also receive training in the principles of food hygiene and food safety, including the importance of employee health and hygiene. Managers and owners will be held accountable for employee training. Under the preventive controls rule, a company must hire someone, or train an existing employee, to make sure the company is implementing the requirements. The larger companies usually have someone onboard to do this, but many small and mid-sized companies don’t. In addition, a company will have to prove to the FDA that the person tasked with this has been properly trained to do the job. And while Youngquist said he believes food safety is of paramount importance, he said he can’t help but think there’s some “overkill” in the rules. Brackett said that while many of the larger companies have the necessary resources when it comes to having a trained food safety worker on site, the small and mid-sized companies generally don’t. “For them, the Food Safety Preventive Controls Alliance is their resource,” he said. The Food Safety Preventive Controls Alliance (FSPCA) was created in 2011 by the FDA in cooperation with the Illinois Institute of Technology’s Institute for Food Safety and Health. 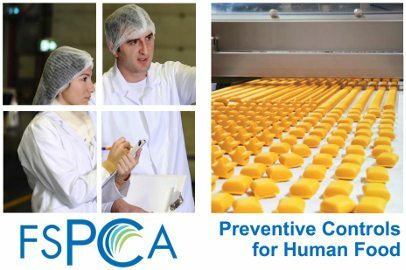 The FSPCA was established to help industry —particularly small and medium-sized companies — comply with the new preventive controls rule as mandated by the Food Safety Modernization Act (FSMA). Members of the alliance are from the FDA, state regulatory agencies, the food industry, and academia. The alliance also has a technical assistance network site, to provide answers to technical questions. People can also ask others in the network for tips about what they’re doing pertaining to specific questions, for example how they store their petri dishes. The discussions can be private or public. Food safety worksheets are also available from the alliance. “All of this is designed to help small and mid-sized companies, especially, comply with the rule,” Brackett said. To date, the alliance has issued 11,000 certificates of qualification to individuals from both large and small companies, 10 percent of which are international. It has also issued 800 certificates for lead instructors. Ironically, FDA has not yet released the guidance documents that companies can use to help them evaluate whether or not they’re in compliance with the preventive controls rule. 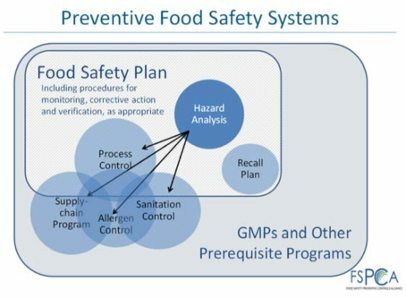 In addition to the guidance documents on hazard analysis and preventive controls, there are documents on environmental monitoring, food allergen controls, validation of process controls, and a small-entity compliance guide that explains the actions a small or very small business must take to comply with the rule. Megan Bensette, FDA spokesperson, said the development of guidance related to the human food preventive controls requirements takes time because the requirements apply broadly across the food industry and because the guidance requires input from many subject matter experts. The agency will issue notices in the Federal Register and make announcements through its “Constituent Updates” of availability of draft guidance documents when they are posted for comment. Food safety attorney Bill Marler said that under the federal Food, Drug and Cosmetic Act, a misdemeanor conviction — unlike a felony conviction —does not require proof of fraudulent intent, or even of knowing or willful conduct. Rather, people can be convicted if they held a position of responsibility or authority in a firm that would have allowed them to prevent a violation. Convictions under the misdemeanor provisions are punishable by not more than one year in prison and/or fines up to $250,000 per count. As for the “heavier stuff” — punitive damages and criminal liability — Marler said it comes down to this question: Did you act with conscious disregard of a known safety risk? Prison time and hefty fines, not to mention steep payments to victims and the closing of a business, can come into play when the answer to that question is yes. This article was originally posted to Food Safety News and can be found here. 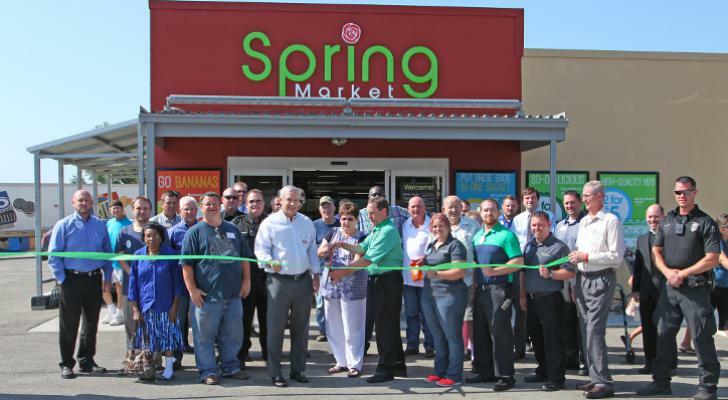 Brookshire Grocery Co. opened its first three small-format Spring Market stores in the Texas communities of Frankston, Hughes Springs and Naples. The three stores are the first of 22 more of Spring Market banner stores to be opened in the coming weeks by the Tyler, Texas-based BGC, whose total store will rise to 177 when complete. As PG reported earlier this year, BGC’s unveiled plans for its new Spring Market banner earlier this year following its acquisition of 25 former Walmart Express stores. The Bentonville, Ark.-based Wal-Mart Stores Inc. pulled the plug on its now defunct Express format in January as part of a retooling of its entire store base. Standing at approximately 12,000 square feet, Spring Market provides a full shopping experience with produce, dairy, bakery, grocery and health and beauty care, as well as a fuel center. Hours of operation are from 7 a.m. to 9 p.m. daily, with several stores set to carry beer and wine. Other Spring Market locations set to open in upcoming weeks include Anson, Diana, DeKalb, Edgewood, Godley, Grandview, Haskell, Italy, Kemp, Leonard, Lone Star, Merkel, Palmer, Redwater, Waskom, Whitewright and Winters (all in Texas), and Colfax, Iowa, Lake Arthur, Mamou and Zwolle (all in Louisiana). For the full article, please visit the Progressive Grocer, here. As part of its new strategic position in the animal welfare arena, nonprofit organization PetSmart Charities, Inc. (PCI) announced today that it is transitioning to an organization focused solely on strategic grant making and that it has granted nearly $7.6 million in immediate funding to more than 85 Animal Welfare Organizations (AWOs). The funds are designed to support animal transport efforts to relocate animals from at-capacity “source shelters” primarily in the South to “destination shelters” primarily in the Midwest and Northeast where shelters and communities have capacity for adoption. As the leading funder in helping pets in need across North America, PCI, along with its Canadian counterpart, PetSmart Charities of Canada, has contributed more than $285 million to date to directly help pets – more than any other funder. The organization recently expanded its mission beyond its core and ongoing cause of ending pet homelessness and helping pets in need to also include connecting pets and people in important ways such as through funding service animal or pet therapy training programs. PetSmart Charities will no longer operate the Rescue Waggin’ transport program and has worked directly with each of the more than 85 partners to provide transitional funding totaling nearly $7.6 million to assist partners in meeting their adoption and animal transport needs. The transitional grants will become active with the AWO partners this month and some grantees are expanding their animal relocation efforts to also include cats. PetSmart Charities believes this new approach to funding animal transport, rather than operating the program, will enable it to make an even greater impact. This fall, PetSmart Charities expects to announce additional detailed news regarding its new strategic grant-making focus, the enhanced online grant application process and expanded grantee opportunities for AWOs and organizations across North America. PetSmart Charities, Inc. is a 501(c)(3) nonprofit animal welfare organization that saves the lives of homeless pets. Each year nearly 500,000 dogs and cats find homes through our adoption program in all PetSmart® stores across the U.S. and sponsored adoption events. Each year millions of PetSmart shoppers generously contribute to pets in need by making donations directly to PetSmart Charities on a pin pad at the registers in PetSmart stores. PetSmart Charities administers and efficiency uses 90 cents of every dollar of those donations by issuing grants and providing other support to help pets in need. PetSmart Charities grants more money to directly help pets in need than any other animal welfare group in North America, with a focus on funding adoption and spay/neuter programs that help communities solve pet overpopulation. PetSmart Charities has received the Four Star Rating for the past 13 years from Charity Navigator, an independent nonprofit that reports on the effectiveness, accountability and transparency of nonprofits, placing it among the top one percent of charities rated by this organization. for the original article in it’s entirety from Business Wire, click here.